The PCL431 has been superceded, please see the CL100 Series Series as a possible substitute or consult OMEGA's Pressure Engineering department. The PCL431 microprocessor-based, handheld calibrator can be used to calibrate and troubleshoot current or process signals. 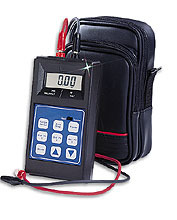 The PCL431 current calibrator reads or simulates a 4-20 mA current loop and provides readings in milliamps or percent. Output values can be selected via the up/down scroll buttons, or by use of the three user-defined setpoints. An auto-step function allows the three stored setpoints to be toggled through at a dwell time, and is adjustable from 5-60 seconds for "hands-free" calibration. 참고: The PCL431 comes with soft carrying case, test leads, 9 volt battery and operators manual.